Vest, Life-Preserver, Type B-4. By Hodgman Rubber Co. Date of manufacture, October 8 1943. The material is in very good flexible condition with light rubbing and fairly light soiling. The 'sides' have much deeper colour and evidence of a dye marker pack - now removed. 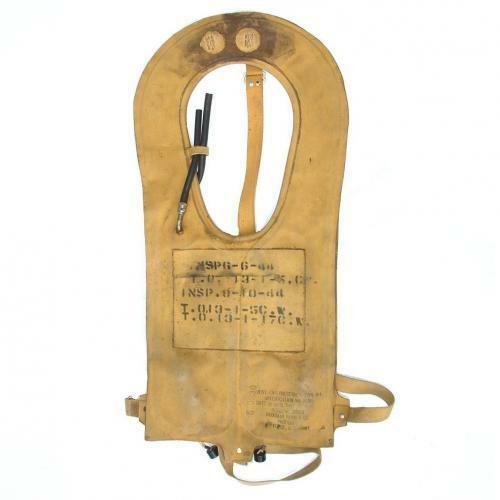 The vest retains the securing straps, all of which are in very good condition. This pre-1944 example is modified with a central neck strap that has been added 'in the field' - later examples were factory fitted. Also has both CO2 bottle holders complete with screw-on covers and pull-strings. The inflation tubes/valves are present and in good flexible condition. Has various AAF stamps/inspection marks c.1944 and has the owner's name ' Donald L Criesedieck'. Criesedieck was born on November 4th 1922 in St. Louis, Missouri, the son of Florence and Louis Griesedieck. He flew as 1st Lt. Bombardier with the 410BS, 94th BG on B-17G 42-31599 'Boots & Her Buddies' and was declared MIA on 6th October 44 on a mission near Berlin. His aircraft crashed near Drowin. (MACR 9349). Reports of his capture were issued by the International Commitee of the Red Cross the same day and he ended up a POW in Stalag Luft 1, North Compound 2, barrack 9 room 6 (nr Barth). He was awarded the DFC during his wartime service. Criesedieck died on January 25th 2010, aged 87. A good '+' used example with interesting history. Stock code MW21313.